A few weeks back there was a topic on what influences us and apparently a lot of us bloggers said that we influence each other. YAY for us. I think its great to hear that we all inspire each other but we all hopefully also find inspiration outside of the blogger world. I know that I look for inspiration everywhere books, magazines, art, nature...etc.. Inspiration can be easy to find if you just are aware of your surroundings. 1. What magazines do you subscribe to? I actually don't subscribe to any but I do pick up magazines monthly like: Elle, Nylon, and Vogue. Every once in awhile I'll buy Harpers Bazaar or W just depends whats on the cover and the inside stories. 2. Do you watch any fashion TV shows? Americas Next Top Model and if there is a marathon of Project Runway on I'll usually sit there and watch it. 3. Beyond blogs, what websites do you frequent for fashion inspiration? I have liked a LOT of fashion related fan pages on Facebook so I usually get updates from Nasty Gal and Soulstruck that would peek my interest that I'll go check out. I also check out a lot of lookbooks from stores and designers. Also magazine editorials of course. 4. Advertisements play a huge role in forming public opinion about a product or brand… what ads do you like and why? I always liked Marc Jacobs campaigns they have that polaroid type of look to it. 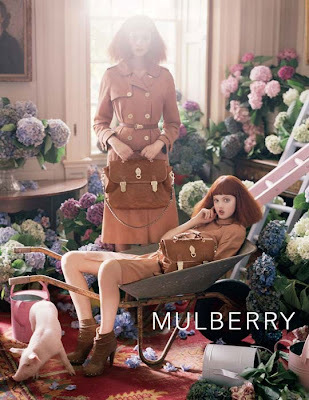 I also like the Mulberry Spring 2011 campaign. I love the lighting in them the soft tones and the springyness about them. Makes me want a Mulberry bag! 5. Do you own any fashion books? I just bought the Alexander McQueen catalog from the MET! I also own Kelly Cutrone's book. Great information. I agree with you. I used to get more of my inspiration from magazines, but since entering the bloggy world, I'm more inspired by other bloggers. I just feel there's more of a sense of real touch, and actual people, versus celebs in clothes that I can't afford. But I still love to read my fashion mags! Ah, can't wait to see the McQueen show. Is the catalog good?